Congrats on a job well done! It really is a wonderful picture. This picture is not a blue ribbon…it is a gold medal. And so are the people in it. Emily is so lucky to have a great friend as you. I wish I had this moment captured in time. It is breathtaking and beautiful. Congrats, the photo is beautiful and you have a wonderful gift. wishing you were a bit closer so you could do our family photos because I have realized it is impossible to do them myself and get what I want. Congrats! As you already know, I think that’s the greatest picture ever taken. The fact that you captured that EXACT perfect moment? Incredible. That picture is amazing. I practically tear up every time I see it because you can see the joy and raw emotion in Emily’s face. And you should feel extremely proud on getting third place at the STATE fair. That’s awesome. Well.. I think it’s awesome.. as a mom I know THAT moment. But sadly I don’t have a photo of THAT moment. THAT mom does. And she’s one lucky mom. Congratulations! I love that picture. It is simply beautiful. I follow your blog but I don’t think I’ve commented before. I just have to say, every time you post that photo I tear up a little! Every time! I’ve never even been pregnant but it always gets me. I love that photo. I bet the first place winner was sleeping with the judges. I’m proud of you, though. Nice job! THIS. That’s how I feel about being a writer, and as a very niche type of journalism (travel), my job’s always on the line and people are always trying to poach gigs. The difference between me and you and all of “Them?” We’ve got talent, they don’t. This ribbon just proves that! Everyone may be “a photographer” to some extent, but not everyone has the passion, the innate sense of composition, the drive that you do. And not everyone wins a prize at the state fair, which is no small potatoes! Remember that! I agree with Carissa. I have virtually no photos of my only child coming into our lives. It’s a great photo. The state fair is nothing to sneeze at! True story: In 2 weeks I am going on a girls’ trip to Green Bay. This has been planned for several months. I am supposed to fly there ALONE, but for a while, it looked like I might have to DRIVE from Roanoke, VA with ALL FIVE of my kids, as it would be the only way I could still go. I mapquested it, and I would be going right through Indianapolis. I thought, YAY, I can get Casey to photograph my kids! as this is something I have wanted since I started reading your blog years ago. When my husband said he could get the time off and watch the kids after all, I was ACTUALLY DISAPPOINTED because I would no longer have the fantabulous photographs that I knew you would have taken. (Of course, then I remembered, 4 days with my friends, without my 5 kids, and I went back to celebrating!) But still, I am mourning the loss of my Casey Mullins photography.. that never even happened. THAT is how good you are. But see, hearing that people I admire doubt themselves makes ME doubt myself even more! But this is a great post, thank you for sharing those words of wisdom. Hey–as a critiquer myself of artwork (at a literary magazine) I have to tell you that once you reach the upper levels of outstanding, the level of subjectivity increases too. In terms of quality, the difference between 1st and 3rd place is often minimal and often just one person’s final decision. You made cheer here. You really did. Yes, seemingly EVERYONE is a photographer anymore, but how many of them have a purdy ribbon to show for it? Show of hands? Anyone? Oh, yeah, just you, Casey. Congrats on your ribbons! Next year? I see a couple of blue ribbons and a big, frilly purple one fo sho. Your photography skills are simply amazing. I think you take lovely pictures. They’re beautiful, particularly your winner up there. But, you’re so right that it is hard when everyone is doing what you’re doing and you have to struggle so hard to be yourself and feel good enough. I think everyone struggles with that. Or most people do. Even though High School was years and years ago, popularity can still get you down sometimes. Hey, ANY ribbon at a state fair is a HUGE success. HUGE. Way to go! Also, I believe I read on twitter that you got 2 ribbons… will you share what other photo you entered? I teared up on Facebook twice – then both you and Em posted, and now again. Forget the ribbon. What’s so very important is the moment you caught that will now live on forever because of your talent. You should be so proud. All I can say is I can’t WAIT for you to talk family picture for us. Seriously, cannot wait. I know of your blog because Emily is a friend of mine from elementary school. I think your picture of her and Gage is purely amazing. Gorgeous. Perfect. Well if it helps any, I sure do admire your work a lot. And that’s coming from a very weathered and weary eye from looking at a LOT of photos. I sometimes feel the same way – that there are so many people out there as “photographers.” But what I have learned is that so many of them really aren’t – they’re not trying to hone their skills, they’re not even aware of what truly makes a good picture. They just think they know. It takes so much skill and knowledge to truly make that leap to actually being a real photographer – and you have certainly hit that mark. I hope I can be there one day, but I know that I have a lot of learning still to go. Just know that your work is admired by many. I, too, did not make the cut for cheerleading. As a senior. After I had been a cheerleader since age 10. You are an amazingly talented photographer, and I’m not just saying that because you’re pretty Congrats on the ribbons!!!! My worst moment was about nine months ago. My worst moment was when I gave up on my thesis and was denied my Maters Degree. My last 3 credits and I just stopped caring. I just stopped writing and researching, and interviewing…I just stopped. I wish that I had the courage and tenacity to keep going because I feel like a failure now. I worry that my real worst moment is yet to come though, that is when my sweet daughter finds out what a failure I am. She will be disappointed, I will be crushed. you nailed it. It does mean the world to me. You captured on picture a moment I knew existed, yet would never really know what actually looked like in real life. never under estimate your raw talent. woah girl, it’s there, and it’s huge. This photo triggers my emotions like no other. I’m so glad you were there to capture this image. First prize! I cried the first time I saw this pic. It is great and you should be very proud! You truly are talented. 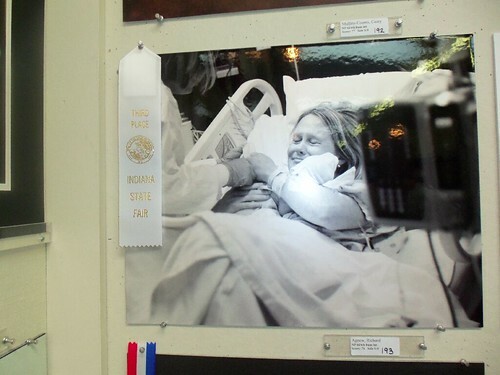 I always want the blue ribbon too, but think of how many pictures will be hanging at the state fair with no ribbon at all. You should be very proud of yourself and how lucky is Emily to have such a great picture of such an amazing moment in her life. What a great friend and photographer you are. I think the “winning” is in the fact that you can take SUCH an amazing and powerful photograph. I only wish I had half of your ability to take photos that speak! You have to have guts to enter photo contests. I know exactly what you mean. I’m no where near the same class as the rest of you, yet. I set up that email address for a job I was doing where I did, in fact, need to be identifiable as the person that had taken the photos. I was embarrassed to use it, though. Felt like a fraud. Some of my blog followers convinced me to embrace it, though. To own the title, to change my twitter name to match, and to go with it. I’m glad I did. I think you are amazing. Just keep in mind that you’ll always take a better shot then someone who just waves their expensive camera around. You have the experience and talent they could never have. I was at the fair yesterday and pointed this particular picture out, I thought it was fantastic. I enter my work about every other year and barely get shown (min score for showing is 70) but I was flabbergasted at how some of the photos were scored. Heck, there was one that was a snapshot with the watermark timestamp on the front and it scored a 71! It’s all a matter of judges opinions at THAT time, and who knows who or what could be influencing them at the time. You have enough fans here and flickr to know you’re a pretty damn fine photograher! I think the picture is so many emotions wrapped into one. This is my dear friends picture who I’ve know for many words and to see that kind of emotion come out of her is more than I can say. She doesn’t ever show that much emotion so to see that picture it takes your breath away.